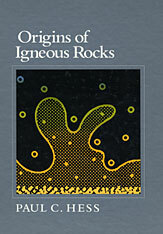 This rigorous and up-to-date synthesis of current research and thought in igneous petrology explores the complex process of the generation and cooling of igneous rocks—those formed by solidification from a molten state, either intrusively, below the earth’s crust, or extrusively as lava. Through the study of the mineral associations, compositions, and textures achieved in the formation of these rocks, Paul Hess traces the evolution of igneous rocks from site of origin to place of residency. He probes the clues that the distribution of igneous rocks provides for understanding plate tectonic processes. And he focuses on a number of unresolved problems critical to igneous petrology: the ultimate source rock of a magma; the location and process of melting; the collection of magma into large movable masses; the extraction of magma from its source and its emplacement onto the earth’s crust; and the conditions of the crystallization and cooling of magma in its ultimate transformation into igneous rock. This comprehensive work, which integrates geochemistry, tectonophysics, and planetary geology with classical igneous petrology, provides a solid introduction to physical processes and isotopic principles and applies these processes and principles consistently in the discussion of petrogenetic models for all the major types of igneous rocks. It is a stimulating resource for students and researchers in igneous petrology as well as for geologists in allied fields (geophysics, geochemistry, cosomochemistry, and metamorphic petrology).